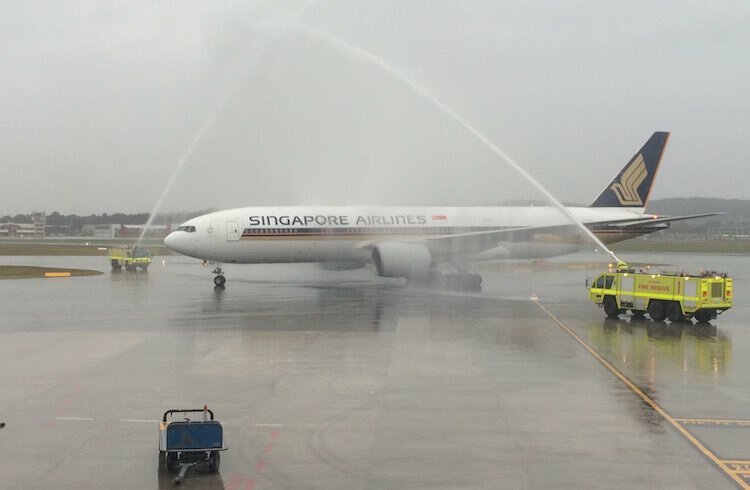 The first scheduled international passenger service to Canberra in more than a decade has landed. 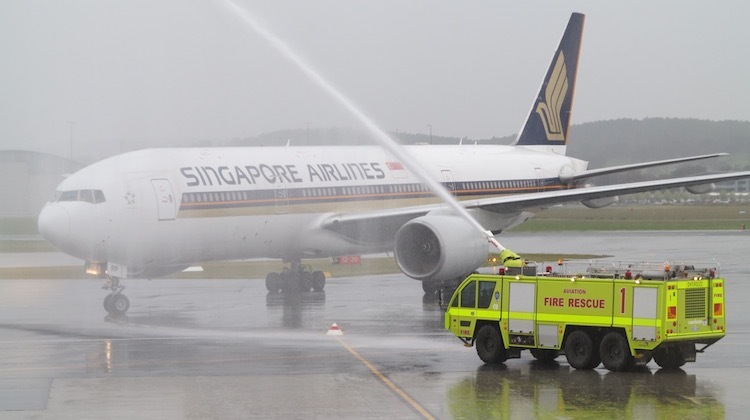 Canberra Airport welcomed the arrival of Singapore Airlines’ (SIA) inaugural service with an Airservices Aviation Rescue and Fire Fighting (ARFF) monitor cross on Wednesday morning. Flight SQ291, operated by Boeing 777-200 9V-SRP, touched down in the nation’s capital a little after 0810, after a seven-hour journey from Singapore, marking Canberra’s first scheduled international service since the short-lived Air Pacific (now Fiji Airways) flights to Nadi in 2004. “They say some of the best things in life take the longest, and this has certainly been 18 and a half years of challenges and hard work, but also a great deal of fun,” Canberra Airport chief executive Stephen Byron told media ahead of SQ291’s arrival. After about two hours on the ground, the flight continued onto New Zealand just after 1000 and arrived in Wellington at 1500. It is the first scheduled passenger service linking Canberra and Wellington. 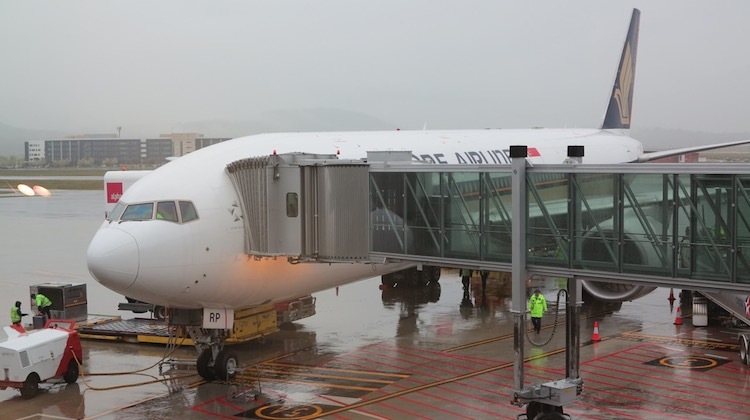 SIA executive vice president for commercial Mak Swee Wah said the new service was a “reinforcement of our commitment to Australia and the entire South West Pacific region”. “The opportunities that flights SQ291 and SQ292 will provide government, leisure and corporate travellers alike is exciting,” Mak said in a statement. The return flight SQ292 from Wellington was in turn scheduled to arrive back in Canberra at 2205, with a departure for Singapore an hour and 25 minutes later at 2330. “The where to next is Wellington,” Byron joked when asked about future international services for Canberra Airport. 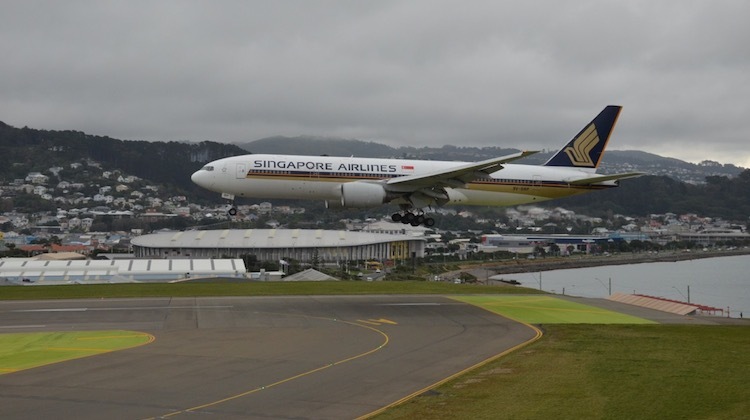 The Singapore-Canberra-Wellington rotation, which the airline dubs the “Capital Express”, is due to operate four times a week with 777-200s configured with 38 angled lie-flat business class and 228 economy class seats. “The bookings are strong for people coming from New Zealand to Canberra,” Byron said. In relation to comments on the previous article about preparations for the SIA service…. This Canberra service is very shrewd by SIA – creating a market and giving the city 2 destinations. Re Townsville – The best chance of success for a city like Townsville is to have a “through” service that instantly creates 2 destinations. In essence this is what Air North is doing with the extension of Darwin-Townsville-Toowoomba. The difficulty for a city like Townsville is that it probably can’t sustain wide body long-range international services, but it would have the market and yield to sustain long-range narrow body services. Philippine Airlines is using this model for Manilla-Cairns-Auckland. It is really an argument about whether Townsville has enough gravitas as a destination when compared to a location like Cairns, and whether an airline is willing to create a market rather than just chasing one. Air North in cooperation with Wagners are doing just that in Toowoomba. Having lived in TSV, CNS, CBR and TWB, I can say that TSV is unfairly maligned much of the time. As a long term resident of Townsville, it is great to see more air services to and from our city. The recent Air North service, Toowoomba – Townsville – Darwin, will prove to be very popular. 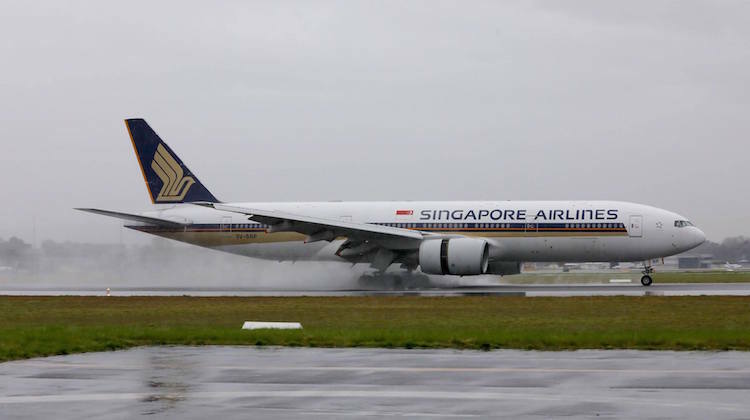 Congratulations to Singapore Airlines for making the running in Canberra – here’s hoping it’s a raging success for both Canberra and Wellington, and underwrites further services in each location. Townsville newspaper today has an article on a push from PNG for direct services to Port Moresby. Combine this with an Auckland – Townsville – Singapore through service (seemingly the most logical and viable routes, via JetStar, Silk Air or Air NZ perhaps?) and the existing Bali Denpasar service (JetStar) and there is enough to effectively run and sustain a successful international airport facility. Worthwhile permanent support services like airport retail need several international services to create economy of scale and momentum. Even airport shopping underwrites the viability of an airport as a worthy destination and departure point. The Bali service, whilst successful in this incarnation is not enough by itself. The Townsville business community and airport operator realise this, but they seem to be perpetually stymied in trying to get airlines to CREATE a market out of Townsville (despite the fact the airlines are constantly doing this out of other airports). Airport management has over the years been much maligned for this failure. The success of Wagners in Toowoomba suggests that very strong and focussed airport management has a significant part to play. It would seem that Townsville is perpetually cast as the bridesmaid by the airlines. Perhaps the fact that the city is seen as a premium business route with government, defence and until recently mining underwriting much of the traffic. Even the fact that Tiger has never pursued Townsville as a destination would seem to reinforce the inability to cast the city as a viable tourism hub. Congratulations to SQ for having the foresight and creativeness to come up with this route and make it a reality. Should have been Virgin Australia or Qantas making the headlines here but that is more than wishful thinking. A foreign airline being the only operator to offer International services from our own Capital, what a disgrace! In saying that, Singapore Airlines leaves both Australian carriers for dead so glad it is them. Well done to Canberra, utilise the service and reward the management of your airport with support and watch the destinations grow. In regards to the topic of Townsville, the performance of the airport is a reflection of the complete failure of its management, nothing will change in Townsville until management or ownership of the airport does. Presume that Canberra will now be chasing further services. Perhaps China given the number of new destinations and Chinese carriers coming into the Australian market? Most Chinese carriers seem to be using A330 which are probably small enough to give sustainable loads. Just to join into the theme of posts – why not Canberra – Townsville – Hong Kong. The TSV airport owner QAL treats TSV as a second class citizen compared to OOL, so getting an airline/s to invest in making new markets is a hard ask. The terminal upgrade is a case in point. QAL wants to share the immediate risk with passengers and airlines via surcharges rather than going it alone and accepting that the benefits of the upgrade (increased utilisation) are long term pay-offs. The real question is how much money did the ACT government throw at SIA to fly here? So Jesta, on the one hand you wave the flag by saying it’s a disgrace that Australian airlines are not supporting services from the national capital, nut on the other you say SQ ” leaves both Australian carriers for dead.” A bet each way…? A huge thank you to the Canberra Airport team, you’ve worked tirelessly to enable people, from Canberra and the surrounding towns and cities, access to international destinations, without the inconvenience of shuttling to/from Sydney/Melbourne/Brisbane. We are immensely proud of all your efforts. Canberra has contributed to SQ’s start-up costs and may be underwriting the route in the short-term. That is fair enough given they are a private business and can do this if they think it will add value to their investment in the longer term. CBR-TSV-HKG would only make sense for VA or QF. Foreign airlines would not be interested as cabotage rules mean they couldn’t carry domestic pax on CBR-TSV leg. TSV airport has been fairly poorly run for a number of years. VA has been asking for space to construct a Lounge but has only been met with promises some time in the future. HBA falls into the same bucket here! Well done SIA on thinking outside the box. Hope this route is a success! Hopefully this the start of airlines recognizing that there are passengers who want to fly to and from places other than Sydney and Melbourne. Why hasn’t Air NZ started hubbing flights in Auckland to Canberra, Newcastle, Townsville and Hobart?All could be served by daily A320s. feeding trans-pacific services. Perth and Adelaide have both been very successful for them. Alice Springs is another airport that could really benefit from a link to Asia and Nz. How about Auckland – Townsville- Alice Springs – Singapore? Tim, does it really matter how much money the ACT government contributed to have SIA fly to Canberra? I doubt that is the ‘real’ question mate, as anyone would know, international aviation is federally-funded. The state doesn’t pays subsidies to the 3 carriers operating there anyway (Qantas, Virgin and FlyPelican, with Tigerair’s return coming up), so even if it did contribute to the flights, money was saved prior to SIA’s arrival, and the cost benefit thanks to the boost to tourism will be tremendous. Bravo Byron and co for delivering at CB.. It seems Newcastle has been forgotten in this equation. Servicing a population of over 900000. The main airlines are not interested in providing alternative Australian destinations let alone International ones. I wasn’t in CBR this morning but from the look of the attached video it looks like it landed on runway 17, not 35. Is that right? Also noticed that he return flight from WLG tonight had to make two attempts to get on the ground using Runway 35, aborting the first attempt and going round for a second go. A subsequent Virgin flight from Coolangatta also tried to land on Runway 35 later, but aborted and diverted to SYD. What is going on in CBR? The go around and diversion were due to heavy fog Alan. Given the number of comments in this post it would be interesting to see an AA editorial on regional or regional-sized cities (150-500,000 population) in Australia, the push for international services, and whether existing or next generation aircraft (narrow and smaller wide-body) are suited to the task. The general flavour seems to be that Hobart, Canberra, Newcastle, Sunshine Coast and Townsville are all variously lacking services that the local populations are agitating for. Government delivery of customs and border control, and creative route planning by the airlines seem to be germane. The idea of linking regional cities on an international flight number from south to north, with onwards service on the same aircraft to an overseas airport seems not to have been explored to any great extent by local airlines (QF, JQ, VA or TT) (Maybe Gold Coast-Cairns-Japan is an exception?). From memory Townsville had QF Singapore services routed via Brisbane previously, but the northern population were always aggrieved at having to go south, AND via the state-capital, before heading north again. This is a great thing for Canberra Airport. However, regarding the previous comments about fog, Canberra Airport MUST install a CAT II/III ILS approach on RWY 35. That way the reliability of this particular flight and all flights into Canberra can be guaranteed. Perth have finally got their act together with this. Canberra needs to as well. @Alan Hume – SQ291 definitely landed using rwy 35. And yes we had fog in Canberra last night. Australia, particularly Melbourne and Sydney are capturing this market. NZ certainly is and this further option of flying into the two Capitals is a brilliant move. Two cities working together with one major blue-chip Asian Airline and the results will be assured. Long live this tripartite endeavour. Re the regional cities discussions – this is where B757 was ideal. 200 pax and a range out past 7000+km. Australian never found a use for them however? There doesn’t seem to be a logical successor in the wings… would be interesting to get a take on how A321NEO / B739MAX size up. Perhaps another article – the great planes that Australia’s airlines never bought. Qantas operated Singapore – Townsville – Auckland and back once a week in the 80s initially using B742 equipment and then B762. Qantas also operated the B747SP to LA from Townsville. Qantas did operate a 767-200 as an international flight from Hobart to Sydney back in 1989/90. Think it operated A couple of times per week. Was a connector to both us and UK flights. Ansett and Australian operated weekly alternating 727 services from Hobart to Christchurch at same time. was full! Only stopped flying as they got rid of only 737 they had that was equipped for the flight across tasman! Singapore operated A number of charter flights to Hobart early 90s using A310. Clearly there is a market for services, just needs right aircraft! As a employee for Air New Zealand for the past 34 years I was based in AKL and moved too NZWN/WLG Qantas operated the Boeing 747sp aircraft and then came the Boeing 767-200ER jets. Finally air new zeland tried this with a Boeing 747B-219 jet in the 1990’s ZK-NZX just for a promo for the All blacks Rugby team. They never said they could get a bigger jet in but it was proven wrong. Air NZ operated there DC8’S daily into WLG. Now the Boeing 777-200 can do it good to see this competition going on. Years ago it was not thought of. United did operate into Wellington on one ocassion with 747 when Auckland and Christchurch both closed due fog. I worked for ATC in 1990s and remember a Qantas 747 from Buenos Aires to Auckland having to consider a number of unusual alternates as Auckland, Wellington and Christchurch were all closed due weather! They considered Dunedin and Invercargill as well as Hobart and Launceston. In the end they flew further sout than normal, overhead Launceston and into Melbourne on minimal fuel! Kudos to SQ for noticing the Canberra-area market. Heckle and Jekyll (Qantas’s two 747SPs) were also used on the Rome service for a few years and were usually pretty full when we flew them (we lived in Rome for 18 years). Long thin routes are a QF challenge and Qantas need to remember that not every long-haul prospect wishes to leave Australia from Sydney or Melbourne, so A380 is only part of the equipment answer. For example, my Adelaide brother has said “never QF again” for internationals – SQ or EK provide direct therefore faster, shorter exit for the Europe annual haul, not to mention direct delivery to mainland Europe. Will 787 be deployed to fill the gap? I dare to hope…. It is only a matter of time before this service goes daily. A stunning move by SIA and partners. Demand will rise. A welcome move.What I would love to see though is Qantas resume Adelaide to Singapore using either 737-800’s or A330-200’s.you have a mix of both people who holiday there,people who like the Singapore stopovers on the way to other parts of Asia or Europe and the university students who head home at assorted times of the year.